For Filipinos, classical music may not have a cult-like following like that of Justin Bieber or Taylor Swift. 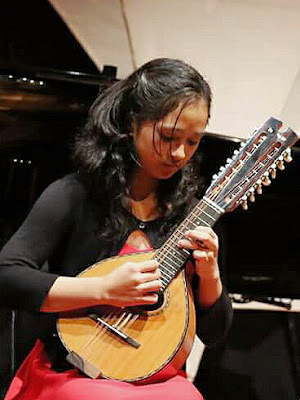 But young and accomplished performers of classical music are showing that classical music can be appealing, too. So today, September 13, 2017, the National Music Competitions for Young Artists (NAMCYA) held a press conference at the Mabuhay Restop in Rizal Drive in Manila. 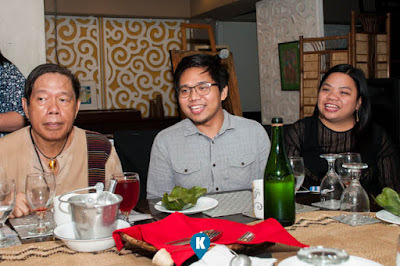 They offered us a brief story of NAMCYA, of how it came to be and extolled its efforts in molding young artists to become great with their craft. They then proceeded to showcase the artists who will be perfoming in the upcoming concert. 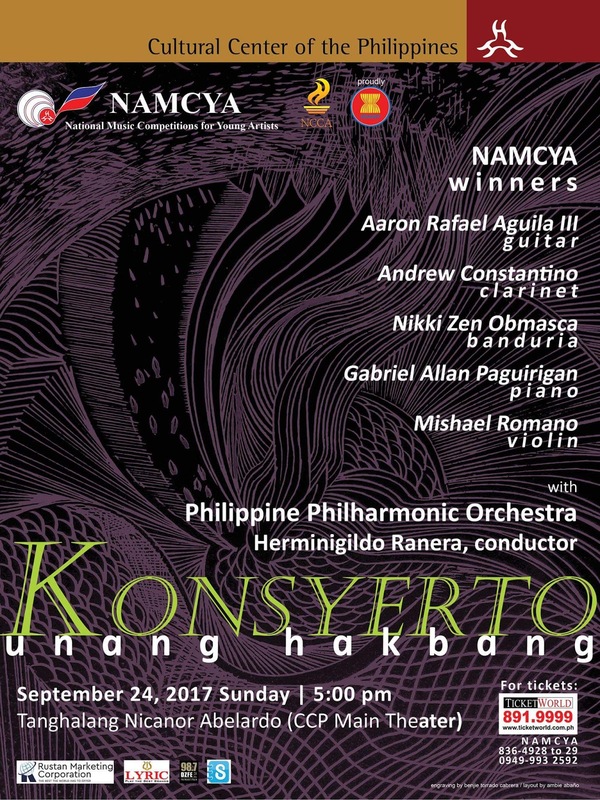 So on September 24, winners of the (NAMCYA), the country’s most prestigious music competition for the youth for more than 40 years, will be performing with the Philippine Philharmonic Orchestra (PPO) to give a sampling of great works of some of the most prodigious composers who ever lived. 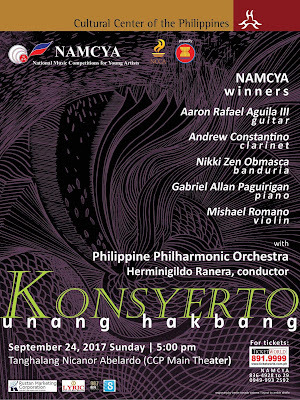 Titled “Konsyerto: Unang Hakbang,” this concert of NAMCYA winners together with the PPO introduces the audience to snippets of longer musical works that have defined musical genres throughout history. Lucas adds that NAMCYA has chosen five of its most recent winners to help bring their music to younger audiences. 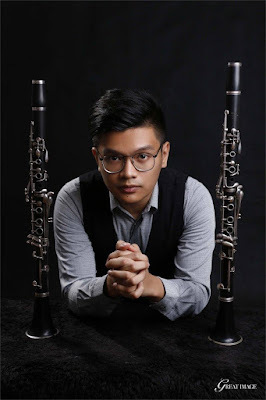 Andrew Constantino, 1st prize & Special Prize winner for Woodwind (Clarinet) in 2015, will explore the leaps and limits of the clarinet range with Allegro from Clarinet Concerto No. 2, Op. 74, of Carl Maria von Weber (1786 - 1826). 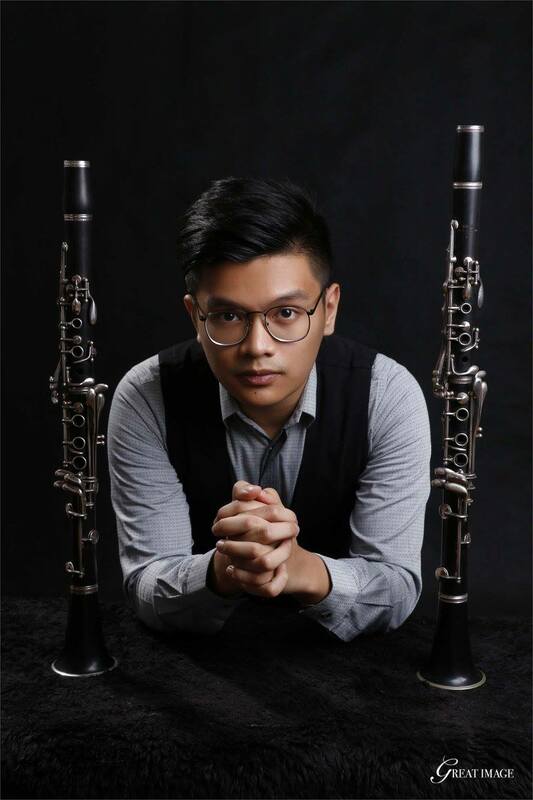 Andrew is a 20-year-old clarinetist who was taught by his grandfather to play the clarinet at age 9. 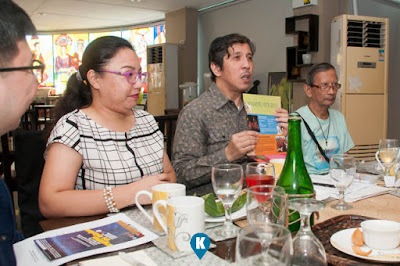 He was also a scholar of the Philippine High School for the Arts (PHSA). 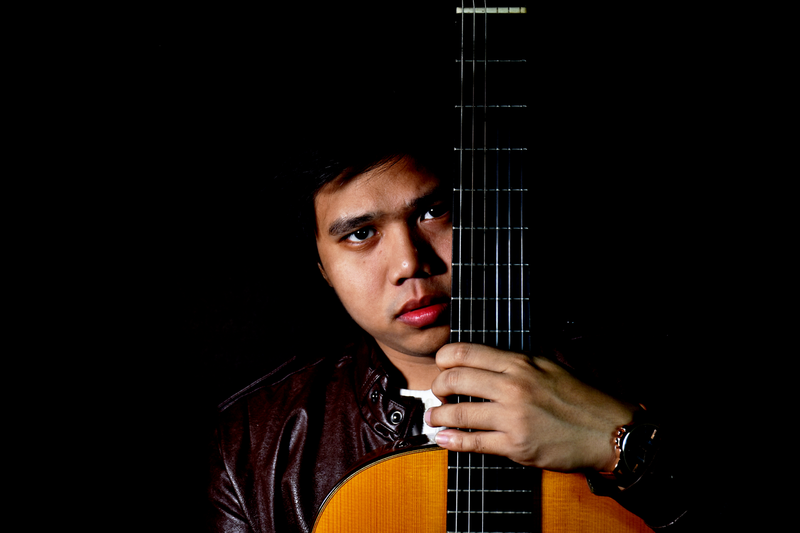 Aaron Rafael Aguila III, 1st prize & Best Interpretation winner in the 2016 Senior Guitar Category, will bring to life a classic guitar piece by performing Adagio from Concerto de Aranjuez by Joaquin Rodrigo (1901 - 1999). Aaron started playing classical guitar at the age of 9 under Ivar Fojas. 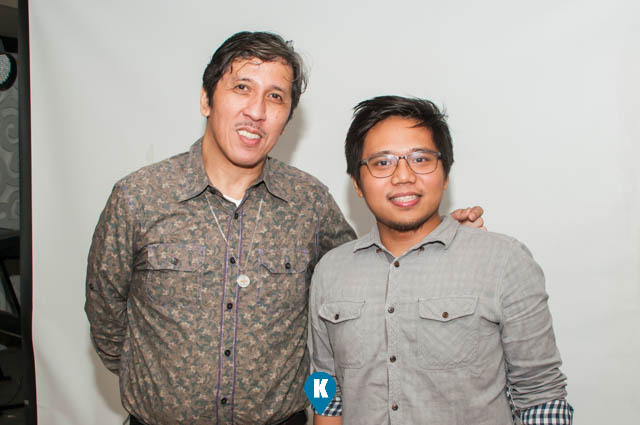 He earned his music degree under the tutelage of Lester Demetillo and has trained with other well-known classical guitarists. Nikki Zen Obmasca, 1st prize winner in the 2016 Solo Rondalla Category, will delight the audience with her rendition of Moto Perpetuo by Nicolo Paganini (1782-1840). This piece of Paganini was made for violin but Nikki will play it with her bandurria and infuse her own virtuosic way of playing. She started playing the bandurria when she was only 5 years old and is now a scholar of the PHSA under the tutelage of Nelson Espejo. Mishael Romano, 1st prize winner in the 2016 Junior Strings (Violin) Category, will attempt to show the innovativeness of Felix Mendelssohn (1809 - 1847) with Allegro molto appassionato from the composer’s Violin Concerto, Op. 64. Mishael is 17-years-old and hails from Dipolog in Mindanao. He started playing the violin when he was only 5-years-old, and because he is homeschooled, he has more time to focus on his music. 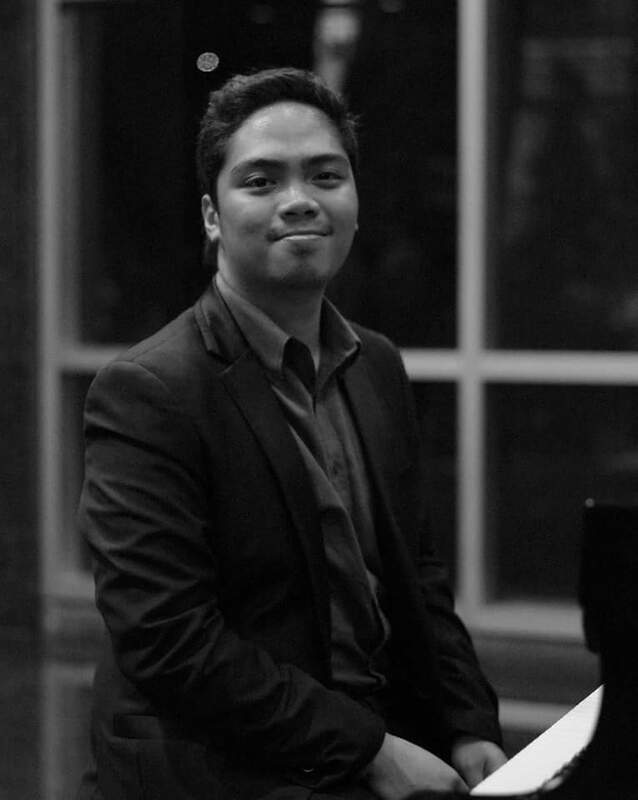 Gabriel Allan Paguirigan, a two-time winner of NAMCYA, having won the grand prize in 2011 (Category B) and in 2015 (Senior Category), will display his artistry and mastery by performing a Hungarian work, Adagio religioso-Allegro vivace from Piano Concerto No. 3, Sz. 119 of Bela Bartok (1881-1945). Gabriel started his piano lessons at the age of 8 and has finished his Diploma in Creative and Performing Music Arts (DCPMA) Major in Piano, under the tutelage of Prof. Luci Magalit and Prof. Nita Abrogar-Quinto. The country’s leading orchestra and resident company of the Cultural Center of the Philippines, the PPO will also perform Der Freischuetz Overture by Carl Maria von Weber and L’italiana in Algeri Overture by Gioacchino Rossini. The orchestra will be under the baton of Maestro Herminigildo Ranera. “We are trying to open up new opportunities for our youth today to explore music from the great composers of the past. We hope NAMCYA’s young artists will help us with that,” says Lucas. For tickets call TicketWorld at 891-9999. For special discounts and other concerns please contact the NAMCYA Secretariat at 836-4928 to 29, 0917-750-0107 or email namcya@gmail.com. Aaron Aguila III happily answered questions from the press. Professor Lucas proudly presents Aaron to the Press. Professor Lucas answers questions from the press. He likewise poses questions to them. LOL. 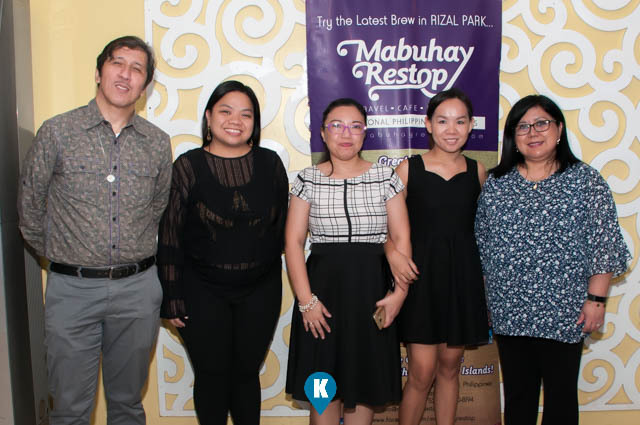 NAMCYA organization poses with Mabuhay Restop Manager.